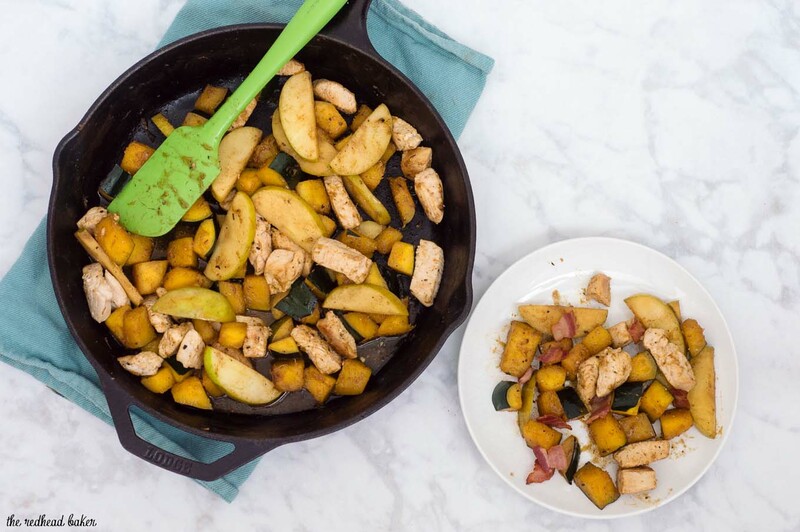 This apple, squash and chicken skillet meal is perfect for busy weeknights: ready in under 30 minutes, and only one pan to wash! Two years ago, we were living in a decent-sized two-bedroom apartment, with a bonus storage room, and a kitchen with lots of counter space. Sure, it bugged us that we were partially below-ground, which meant little natural light, and more than a few unwelcome creatures coming to visit. The biggest problem wasn’t in the apartment itself, it was the area elementary school. Philadelphia public schools are in dire financial straits. The school we were zoned for was low-performing and there’d been several reports of drugs in the school — yes, in the elementary school! We decided to look for a new apartment. We found one close to an area we’d lived previously, before having our son, in the heart of Philadelphia’s Center City. The local elementary school is still part of the Philadelphia school district, but has much more parental and community involvement and has much better results. The neighborhood is highly walkable (which we love), and the 2nd floor apartment gets lots of natural light. The kitchen, though, has about two square feet of counter space, and NO DISHWASHER. We noticed the lack of counter space, but figured we could make do. We didn’t even notice the lack of a dishwasher until we were moving in. No worries, we thought. We can live without one. Well, as time goes on, no, we really don’t want to live without one. Now that we both have new jobs outside of the city, we’re starting to look into moving again. 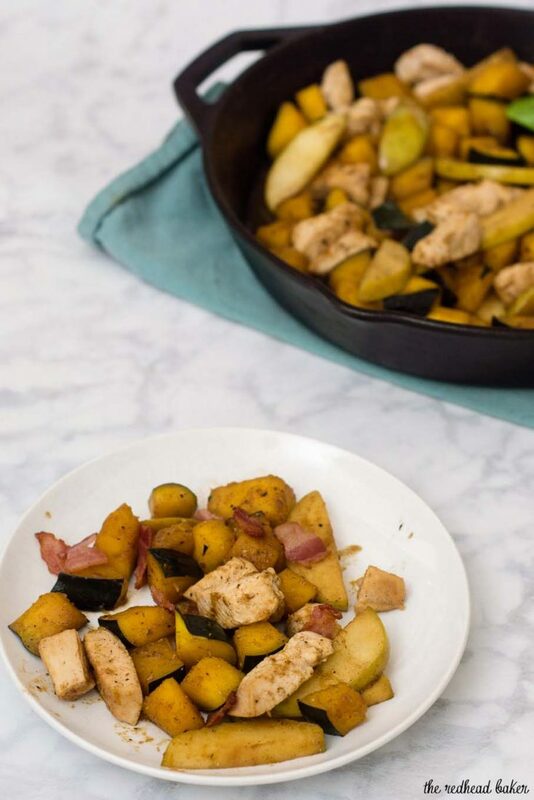 In the meantime, though, one-skillet meals are invaluable because who wants to wash a skillet AND a pot or two, in addition to three plate, three sets of silverware, and three cups? Not me! 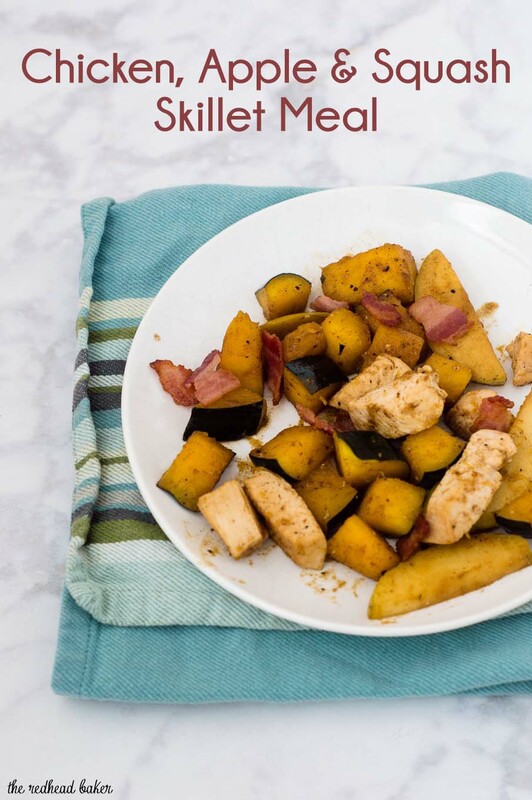 Every ingredient in this recipe is cooked in the same pan, and the flavors from the bacon infuse the chicken, then the chicken flavor permeates the apple and squash. Finally, chicken broth is added to the pan to soak up all the flavors from the dish into a pan sauce. It’s also ready in under 30 minutes! 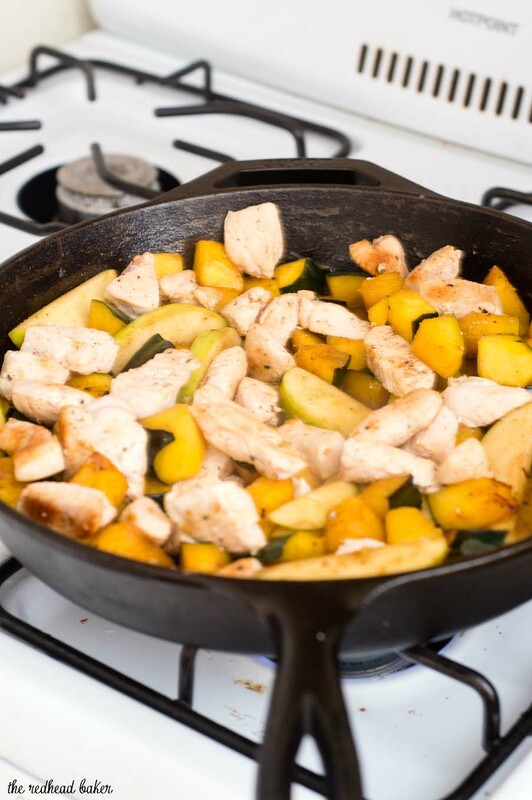 Pin this recipe for Apple, Squash and Chicken Skillet Meal for later! Place the bacon in a large skillet. Turn the heat to medium-high and cook the bacon until crispy (about 5 minutes). Remove from the skillet with a slotted spoon to a paper-towel lined plate. Set aside. Season the chicken generously with salt and pepper. Cook the chicken in the bacon drippings on all sides until cooked through (about 8 minutes). Remove the chicken to a plate, tent with foil to keep warm. Add the squash to the skillet, season with salt and pepper. Cook, stirring occasionally, until fork-tender, about 10 minutes. Add the apples to the pan, and sprinkle on the cinnamon and nutmeg. Cook for 2 minutes, then add the chicken back to the pan. Pour the chicken broth into the pan and cook another 2 minutes, until the broth reduces and thickens. Stir occasionally to coat the chicken, apples and squash in the sauce. Divide among 4 plates, and top with the crispy bacon. Discover more #SundaySupper Easy Skillet Recipes! Good luck house hunting. This skillet sounds perfect. Mmmm! The simplicity of this makes it all the better!! 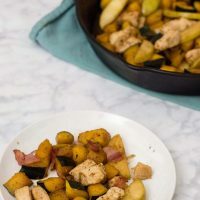 I can see why you love skillet meals! This one looks terrific!! !